In September, I began to explore assistive technology services within arts organizations and identified an apparent divide among the use of these assistive technologies by nonprofit arts organizations. Since then, I have been conducting research to better approximate the division in providing these services, including a survey of arts organizations (yes, you!) throughout the country. As survey results continue to roll in, let's take a closer look at one form of assistive technology: open and closed captioning. How are these captioning options used for performances and what are some cost-cutting methods to implement these services? Open and closed captioning are two different means used in live performances (among other settings) to present the script, sounds, and any off-stage actions in text form. The primary difference between these two services is whether or not the audience chooses to see the text. 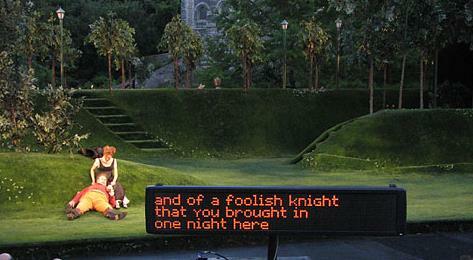 For open captioning, a LED-captioning screen is placed just out of the “stage picture” of a performance, and the text is displayed synchronous with the actions presented on stage. Someone hired by the theater (a trained captioner) manually operates the flow of the text on the screen. With open-captioned performances, everyone in the audience is able to see the screen, but it is typically located in an area that provides little distraction for audience members who do not wish to utilize open captioning. Closed captioning is very similar, but allows patrons the option to see the text. Small handheld devices are provided to audience members upon request, and some closed captioning devices do not need manual operation. Closed captioning can eliminate extra staff time in operating the service, but eliminates the open viewing of text for all patrons. According to the Theatre Development Fund (TDF), hiring a captioner for one live performance on average costs between $1,200 and $1,800, and includes formatting the script, previewing the show, synchronizing text scrolling, and providing the display. If an organization has a trained captioner, LED screens can be rented by companies such as Electronic Signs, Ltd.
VSA, the international organization on Arts and Disabilities, has provided open captioning equipment for its affiliates in several areas of the U.S. and have created “hubs” to share this equipment with surrounding organizations, free of charge. While VSA is not the direct contact that fosters the shared services, individuals can contact local VSA affiliates to inquire to borrow equipment. Other options for funding to implement open captioning include a partnership with TDF and its National Open Captioning Partnership. TDF sponsors one to two-year partnerships with regional theatre companies to increase the attendance of persons who are deaf or hard of hearing. This partnership is intended for theatres that have never tried open captioned performances. TDF provides the cost of service, promotional help, and a level of expertise in implementing OC services. For more information, take a closer look at TDF resources on open captioning for theatre. Questions? Insights? Comment below or email editor@amt-lab.org. Last week, I released a survey asking individuals to provide information on various assistive technology services used in their organization. The survey focuses on services for individuals with sensory disabilities, including open captioning, audio description, and ASL interpretation. It discusses the frequency of such services, audience participation and reactions, and any immediate challenges. If you haven’t taken the survey yet, please take it now!